I know I bang on about the sun and it’s damaging effects on our skin, but I am a firm believer in keeping my face out of direct sunlight. And the only way to do this, when it’s properly hot is to wear a hat at all times. Yes, it gives you a hot head and hat hair, but it’s not only protecting the delicate skin on your face from the sun’s harmful UV rays, but it also stops you from squinting by shielding your eyes from bright light. I haven’t got any crows feet (yet!) and I am sure it’s because I have very light sensitive eyes so I have always worn sunglasses and a hat in the summer. 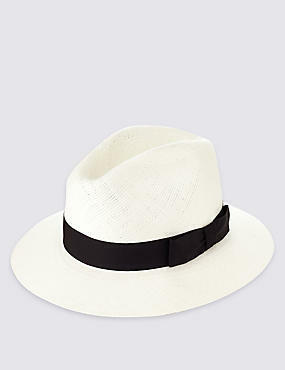 And for me, the hat that suits everyone and never dates is the classic, traditional panama hat. I have a beautiful one from Davina Mulford which I wear a lot (if you follow me on instagram you will know this!) but I tried on one today in M&S men’s department and I thought it was a really good price at £49.50. I have a pinhead, and found the small to be quite small, so I would think a medium would be good for anyone with an average sized head. When it comes to travelling, I usually wear my hat on the plane, but I have packed in my suitcase before, and it travelled very well. I put it in first, and pack around it and in it, and this keeps the hat in shape. Otherwise, you could opt for a folding version like this one below, but it does have a blue ribbon instead of the traditional black. I wish I could do a hat like you do! I love the Idea of a hat, but on sunny days I do not want my hair down, sweaty neck is the worst! 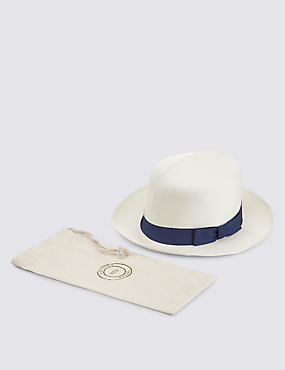 So if I wear a hat it’s not so stylish as a Panama, usually a white (washable) baseball cap, which is a sports one so my head actually breathes. The upside is that my head and dark hair is cooler than no hat!